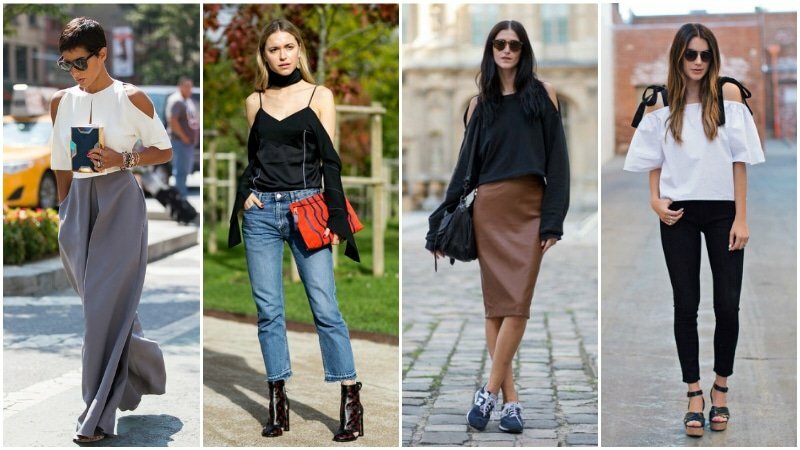 To say that off-the-shoulder tops are just a trend is a big understatement. Their undeniable presence on the runway, red carpet and streets, has turned this style into a 2016 wardrobe must-have. 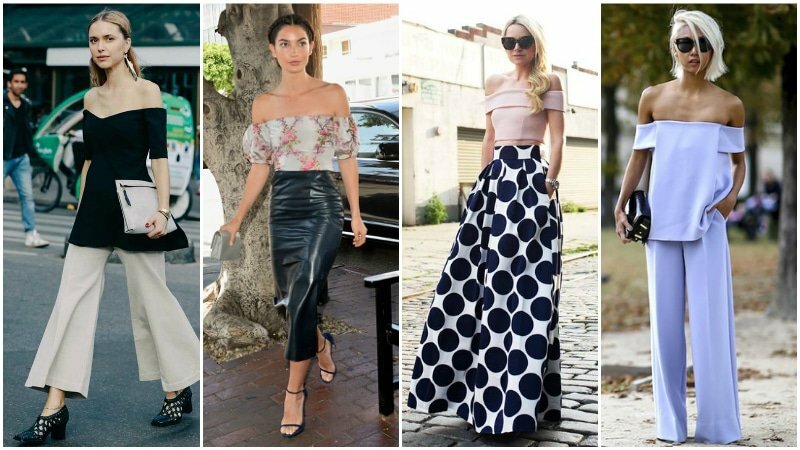 Whether they’re worn casually with jeans and flats, or dressed up with a midi skirt and heels, off-the-shoulder tops are popping up at every occasion. Their versatile nature combined with that stunning neckline make them a winning style that you simply must try. Whether you’re headed to brunch, dinner, or even a fashion show, here’s everything you need to know to wear and style off-the-shoulder tops. When you’re in need of a dose of feminine fashion in your everyday wardrobe, look to the casual off-shoulder top as your solution. The unique neckline of this style cuts across the chest and upper arms to create bare shoulders. This flash of skin elongates the neck and creates a look that is both flirty and fun. Choose a style that is gathered with elastic at the neckline and that flows out over the bust. This relaxed style will provide a ruffled look that is perfect for daytime casual. Just remember to opt for a cropped version to avoid looking swamped in fabric. Pair with jeans or a skirt and open-toe sandals for a relaxed summery vibe. 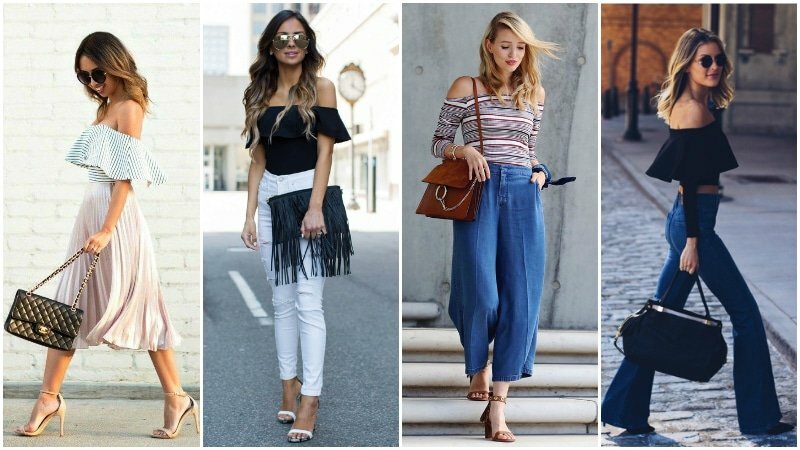 Off-the-shoulder tops have been around for a long time, but they’ve never been as versatile as they are today. 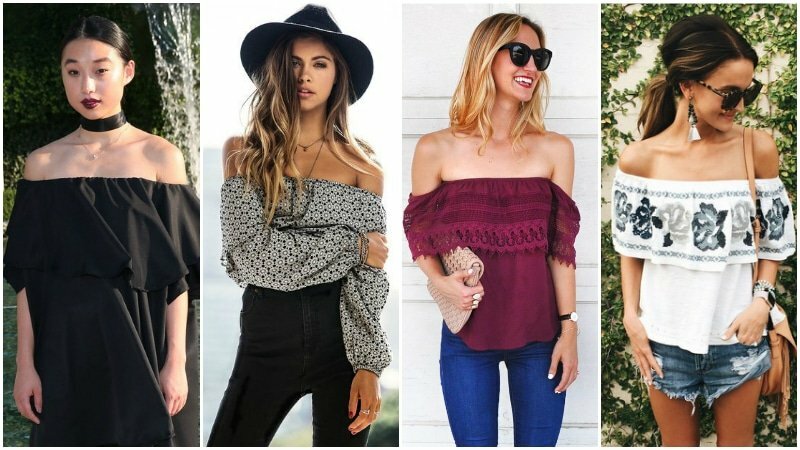 While the bohemian, peasant-style off-shoulder tops of the ’70s still exist, a new breed of off-shoulder tops has also been born. Sleek, minimal and structured, they provide attractive contours and unique silhouettes. They are made of neoprene and scuba, and fit like no off-the-shoulder top has before. Try a lengthed variety in a neutral colour with matching pants for a super sophisticated cocktail look. While practical dressing is all well and good, there’s only so much gym leggings and runners that we can take before we’re begging for some real fashion. Statement off-the-shoulder tops are just that. They may not be the best items to wear when you’re shopping for groceries, but if you’re headed to a fashion show or anywhere that calls for a little wow-factor, they’re perfect. Look for styles that break the mould in the way of shape, fabric, colour and pattern. Pick from oversized bell sleeves, long tunics, bold stripes, or styles with matching pants to stand out in the style stakes. Cropped, flowy, off-the-shoulder tops can create a great relaxed look, but if your style is more about the city than Coachella you may want to try a different style. Bodysuit off-shoulder tops are the perfect option for anyone looking for a sleek and polished version of this trend. Created like a leotard, these bodysuits smoothly against your body for a fitted look while all the style of a regular off-shoulder top. To nail this look, choose simple styles in comfortable stretch fabrics and pair with a killer pair of pants and heels. The best part is, you’ll never come untucked or have your top bunch-up messily thanks to this chic style! We love off-the-shoulder tops, but they’re not always practical (like anytime you need to raise your arms above your head!). That’s why it’s always great to invest in a cold shoulder top as well. Cold shoulder tops are similar to off-shoulder tops except that they feature straps that are added to the style or full sleeves with cut-outs at the shoulders. The extra fabric of this style helps to support the top and anchor it in place. While the look may not be quite as striking as completely bare shoulders and neck, the graphic flashes of skin create a fashion-forward look, and the added straps allow for more innovation in the sleeve design. This style is perfect for anyone wanting to take this trend into a formal or business setting. The unique neckline of an off-the-shoulder top is what makes it a special piece of clothing. That clean line, straight across the chest and upper arms, creates a striking contrast between fabric and flesh that shouldn’t be interrupted. That’s why when accessorising off-the-shoulder tops, you should aim to accessorise around the neckline instead of over it. A thick fabric choker that matches your top is a great option as it adds to the graphic nature of the look. Bold, statement earrings can have a similar effect, offering decoration while keeping the chest area bare. For a more bohemian style, try layering short necklaces and adding a hat. If you’re after a casual look, however, you can also simply accessorise with sunglasses, a watch and light bracelets. Whatever your style, finish your look with a clutch or small carry bag to avoid straps getting in the way of your top. 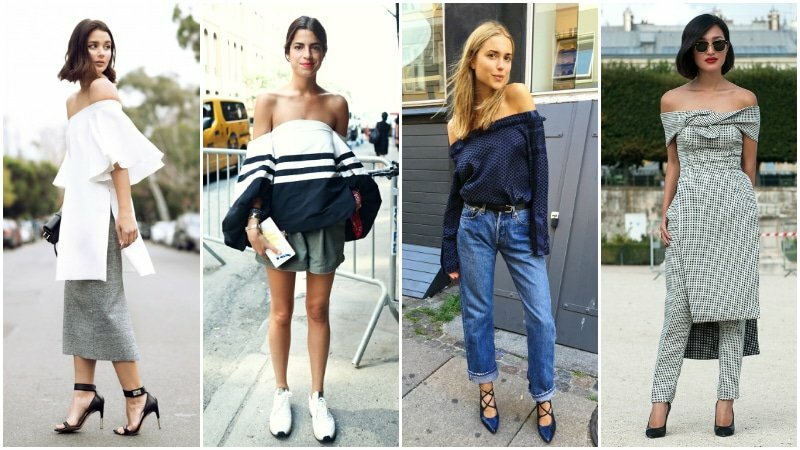 Anyone who’s ever worn an off-the-shoulder top before knows that they can be tricky to keep in place. By just lifting your arms up, the neckline can slip up, off your shoulders, and instantly ruin the whole look of the style. Well thankfully, there’s actually a super-easy way to ensure that your shoulder top stays in place. All you need is four safety pins and two elastic hair ties. By pinning the elastic bands from the front to the back of each sleeve, you can create faux straps that stretch with your body but keep your top in place. This video will take you through the simple steps to fix this problem.